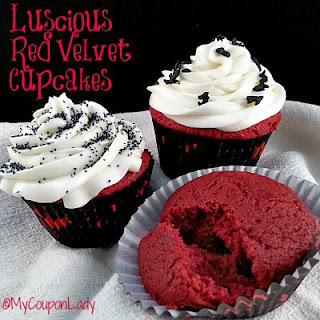 This time, we HAD to share these amazing Red Velvet Cupcakes from My Coupon Lady! Buttermilk, baking soda and vinegar are her secret weapons to make these amazing cupcakes! Halloween Obesity Letter a Hoax?? TeeSpring to Launch YOUR Next Fundraiser! Ace Hardware Black Friday 2013 Ad! Lovable Labels 10th Anniversary SALE!!!! Another Delicious Recipe: S'Mores Cupcakes! MMMMM . . . Monday!!!! Freebie Friday: Pampers Gifts to Grow Code! Bestowed September Review and Coupon Code! !